NEW YORK, October 8th, 2014 – Hayko Fine Rugs and Tapestries left the East Side three years ago, but returned recently with a permanent exhibit at the famous New York restaurant Nanni. Regularly there will be a new picture of a single Hayko carpet on display at Restaurant Nanni, at 146 East 46th Street, New York, off the corner of Lexington Avenue. It will be a special selection for Nanni patrons. Restaurant Nanni has been a New York Institution for more than 40 years, since its founding 1968 by Luigi Nanni, a native of the Abruzzi region of Italy, offering an innovative fine Italian dining experience, at a time when the dominant experience of Italian food was simplistic, with a heavy reliance on the garlic and oil. Nanni brought Italian cuisine to Manhattan diners. On an average day reservations may come in from all over the tri-state area, and as far away as London, or Texas. With its convenient location, within striking distance of Grand Central Station, it is one of the many New York secrets that seems reserved for those in the know. You would pass it by, unless you knew. Luigi Nanni passed away in 1998, but the Nanni tradition was continued by the current owners, Victorio Miriel and Silvo Sclano, who bought the restaurant from the estate in 2004. Victorio is the public face of Nanni, you’ll meet him when you come in, Silvo runs the kitchen in the best of the Nanni tradition, offering high quality trattoria cooking for discerning New York diners. Once you enter under the non-descript Burgundy red awning that has the name on it, you will pass the coat check and a small area with some tables upstairs, next to the bar and then you go down a few steps to the main dining room, which has picturesque Italian paintings painted directly on the walls. You will usually be greeted by Victorio, who handles the reservations. You will forget you were in Manhattan. It is an enclave of casual elegance that allows you to forget the hustle and bustle of the day. A picture of this second “Nanni special” of a Hayko Carpet is to be seen on the left wall, right after the telephones. 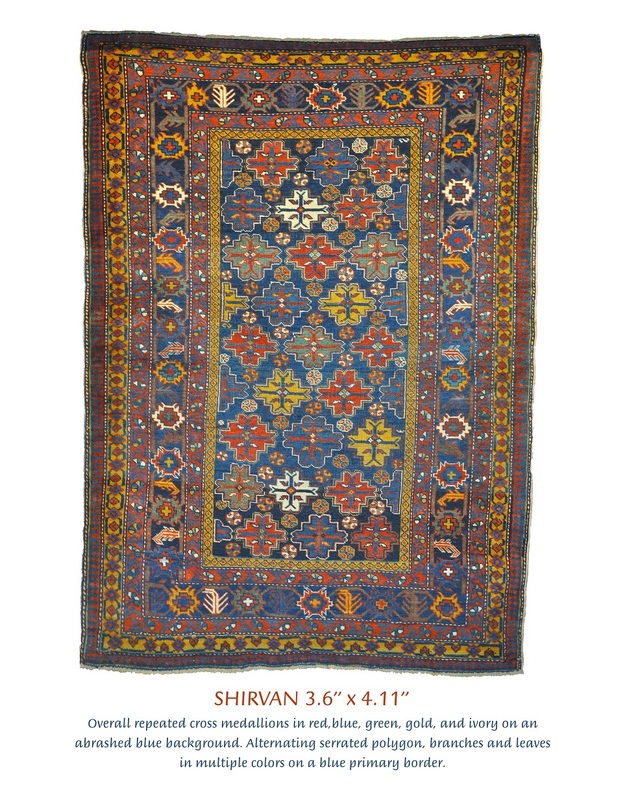 The design is from the Shirvan region of the Caucasus, and it is dated from the 1930’s but the designs go back to the 1880-1890’s. These carpets were produced after the Caucasus came under Soviet control, and they are known as “five year plan” rugs. This particular carpet stands out because it is very colorful, has good wool quality, and its overall design of cruciform and hexagonal patterns. Hayk Oltaci, is a master craftsman, and expert in Oriental carpets, and at his showroom/studio in Long Island City (9-20 35th Avenue Space 3D – www.hayko.com) he offers all of sales, cleaning and restoration.